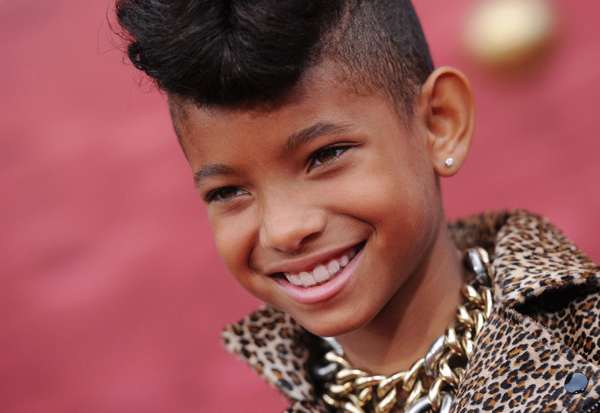 Rap Royalty Jay-Z is helping ten year-old Willow Smith with her debut album. Smith told Kiss FM, "Whenever I have a creative block, he's always like, 'Do what artists do when they have a block. Make a song about it.'" This kid is so energetic, between watching her videos and listening to her talk about her "creative blocks", I just want to take a nap. She has the kind of energy I could only obtain through twelve hours of sleep and a few Red Bulls. Recently Jay-Z told Hollyscoop, "When she comes in a room she lights up the room. She's ten years old, and just the way she carries herself is just amazing." Smith is so confident in interviews it's almost intimidating. Most of us can only achieve that level of confidence after a bikini wax, a laser peel, and a glass bottle of merlot. Smith told Kiss FM, \"Whenever I have a creative block, he's always like, 'Do what artists do when they have a block. Make a song about it. '\"
This kid is so energetic, between watching her videos and listening to her talk about her \"creative blocks\", I just want to take a nap. She has the kind of energy I could only obtain through twelve hours of sleep and a few Red Bulls. Recently Jay-Z told Hollyscoop, \"When she comes in a room she lights up the room. She's ten years old, and just the way she carries herself is just amazing.\"